Clutch is designed to transfer the torque from engine to transmission. 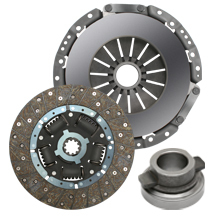 For convenient vehicle service the range of clutch parts is presented either as clutch kit, which consist of cover, driven disc and clutch release sleeve assembled with bearing or separate parts – driven disc or clutch release sleeve. Driven disc is most important part of friction clutch. It takes torque from leading parts and passes to transmission due to friction force on working surfaces. Clutch release sleeve can be manufactured by casting followed by mechanical processing, from steel plate by cold forming or from high strength nylon by mold casting. Special construction angular contact ball bearing is installed into release sleeve. Bearing surfaces which contact with plate spring of pressure disc are being processed with additional heat treatment to prevent wear of interfacing surfaces. Quality carbon spring steel and advanced friction materials without asbestos are used for production of driven disc. During production process all disc details fall under several interim quality tests. Driven disc pass full quality control on special equipment immediately prior to shipment. Quality carbon spring steel and high-strength nylon are used for production of clutch release sleeve. Bearing is filled with lubricant, optimized for entire operating life of the clutch. Increase durability of gearbox synchromesh. Estimated operating life of HOLA™ clutch kits is more than 100 000 km run*.